What is a Golf Club custom fitting? A golf club custom fitting is going through an accurate process of trial and error to find the best combination of golf club loft, club lie angle, shaft weight & flex and club swing weight that can be suited to a golfer’s swing to hit more accurate golf shots. In recent years the technological advances have made the golf club fitting process easier to measure and analyze all types of golf swings. A golf club custom fitting used to be a method for only the top amateurs and golf professionals identifying what is the best golf club they should use to play better golf. But this is not the case any longer. Golf club custom fittings have become increasingly popular in recent years, offering golfers the ability to measure their golf swings and understand what golf club specifications work best for their swings. Your arm length, measuring from your knuckles to the ground? Using Trackman to measure your clubhead speed ? Comparing current six iron to possible new six iron? Looking at your golf swing technique? We use the Mizuno Shaft Optimizer and Swing DNA system along with trackman to clearly identify what shaft and clubhead will suit your golf swing. Our club fitting session typically lasts about 1 hour. We need to test your current golf clubs performance verse the suggested new golf club to show you the differences in performance. If asked I will gladly offer golf swing advice during the club fitting session. Where can you find a location to book a golf club custom fitting? Visit your local PGA Professional. He or She will have the experience and knowledge to work with you to find your particular golf club specifications to suit you. But depending on their golf club facilities that golf club fitting maybe hitting golf balls into a net and this is called a static club fitting. The disadvantage with a static fitting is that it’s hard to get a feel for the golf club and you won’t be able to compare the ball flight against your current clubs. A PGA professional at driving range would be best suited that at a golf club with poor facilities. At the driving range, you could well be hitting balls with a launch monitor comparing data between different golf club models and shafts. The various companies such as Titlest, Taylormade, Ping, Callaway & Cobra set up demo days at golf clubs and driving ranges. These golf club demonstration days are typically arranged through PGA Golf Professionals working at driving ranges, or golf club custom fitters and golf retailers. Expert club fitters will be on hand to go through the range of clubs and shaft flexes. It’s likely you can test just about every type of golf club from that company’s product range. Unfortunately, the downside is that this type of fitting may only be scheduled once a year in your area. This is probably the best option; book into a golf club fitting centre such as the Titleist or a Mizuno Club Fitting Centre. You can arrange a Mizuno Golf Club fitting with us at John Dooley PGA. Also, we can arrange a Titleist fitting for you at the Carton House. There are also Ping & Taylormade fitting centres located in the UK. Consider, making an appointment with a local professional golf club fitter. Their service is focused solely on finding the best golf club specification for you. Notably, it’s likely there will be no bias on what shaft of what your best fit club is for your swing. You can research this on-line by checking who is the local golf club custom fitting expert. Do check that the Club Fitter is a skilled and professionally certified. Also, he/she uses technologies like Trackman or a launch monitor that will highlight the golf clubs that are tested. Certainly, do visit a club fitter that uses a good quality golf balls with reliable technology to measure golf club swing speeds & etc. Such as up to date certifications (such as Trackman University Certification, level 1 or level 2). Also, that you will be fitted hitting balls off grass compared to hitting balls off a range mat. Finally, that you see will see the ball flying rather than hitting a ball into a net. Recently using trackman we tested the difference between hitting golf balls off a golf range mat that we use verses hitting balls off the grass. From the trackman data collected, we have found that there are major differences between the two scenarios. Essentially, hitting golf balls off a range mat will more than likely launch the ball higher compared to hitting off the grass. Resulting in longer shots from the mat compared to hitting from the grass. Also, the ball spin rates are completely different. I would recommend that golfers should be fitting hitting balls off grass rather than a range mat. 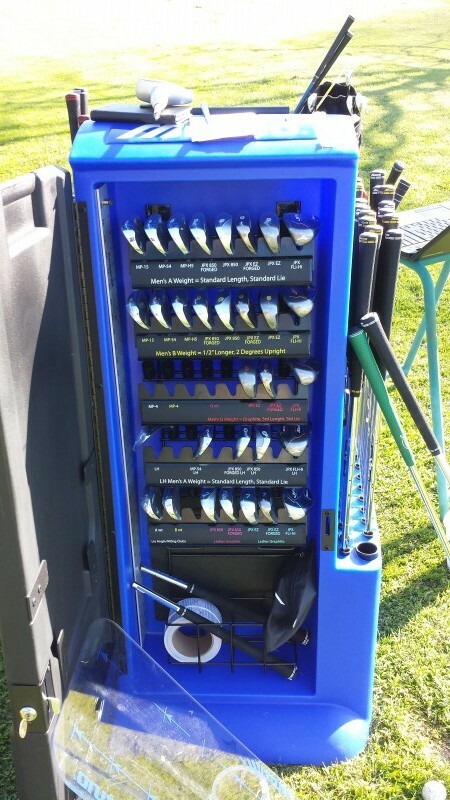 What type of player should arrange a golf club fitting session? Finally, all golfers should be measured and fitted for golf clubs to suit their golf swings. It does not matter if you are a beginner, a scratch, a mid or a high handicapper. Certainly, you will hit your best shots a lot better with the right clubs for your golf swing. If you have any questions or if you would like to talk in more detail about golf club fittings? Please do not hesitate to contact me.